Found on the Mobile Web is a weekly WAP Review feature listing newly added and updated sites on the YesWAP.com mobile portal and WapReview mobile site directory. With these latest additions the directory and portal now list 2349 mobile sites. 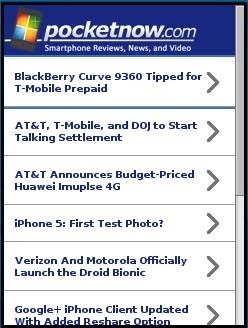 Pocketnow m.pocketnow.com Online since 2000, Pocketnow is one of the oldest sites covering mobile tech. Originally focused on Windows Mobile, today’s Pocketnow covers all the smartphone platforms with an emphasis on Windows Phone, Android, and iPhone. Frequently updtaed with the latest reviews, news and videos. SMS4buddy m.sms4buddy.com Canned SMS messages for every occasion including famous quotes, expressions of love and friendship, jokes, inspirational sayings and advice. The site has buttons for sharing a message on Twitter and Facebook but there’s no button to send the message as a text. The site does provide the message in a textarea for easy copying but it would be nice to also have a “Text this:” link using the sms: URI scheme, though not all phones support sms:. Some that don’t use smsto: instead. SocialTimes socialtimes.com News website covering the people, business and culture of social media. Covers Facebook, Twitter and other social media sites and services and the people creating and using them. Global Voices globalvoicesonline.org An independent non-profit that aggregates the best posts by over 300 bloggers and citizen reporters from around the world with an emphasis on non-Western and underrepresented writers. The site advocates for freedom of expression and provides a place where censored voices can be heard. Global Voices is translated into 30 languages. Scoper – Horoscopes scoper.info A simple, single purpose site, Scooper serves up your free daily horoscope in a mobile friendly format. Santander UK m.santander.co.uk Mobile online banking for Sandander UK Bank customers. Features include: Viewing account and credit card balances and account details, view recent transactions, transfer funds between accounts, make a payment to an existing payee and view cancel and amend pending transactions. Paul Rouget’s Blog paulrouget.com Paul Rouget is a developer at Mozilla who also presents at tech events. He blogs about Web and browser development and design and occasionally mobile. His post “Mobile Web: Taiwan, Opera and WebOS” is a must read for mobile designers and developers. Paul’s blog, which I’m guessing runs on his code rather than an off the shelf CMS, works equally well in both desktop and reasonably capable mobile browsers. Abctv.mobi abctv.mobi Portal and search engine for streaming TV stations from arond the world in all languages. Live online Television in Windows Media Player, Winamp, Real Player and 3gp formats. Watch and listen to live movies, news and reports on your phone. This site is not, as far as I can tell, affilaiated with the ABC TV broadcast network. in the US. Virgin Mobile (USA) m.virginmobileusa.com Account management portal for customers of Virgin Mobile, one of several PayGo brands operated by Sprint PCS in the US. Features include viewing your call and message logs and current cash balance, adding funds, changing plans and changing your account PIN. This entry was posted in Found on the Mobile Web and tagged Banking, Blogging, FOMW, Horoscopes, Social Media, Tech News by Dennis Bournique. Bookmark the permalink.